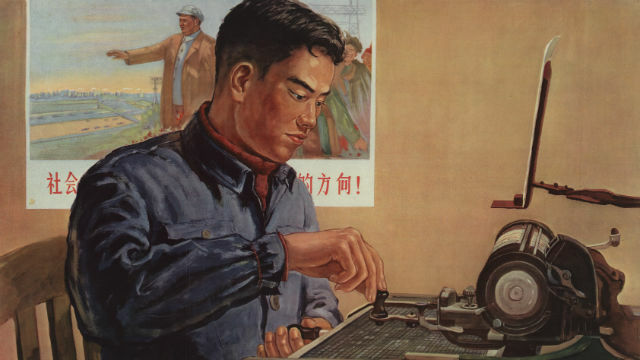 A man uses a typewriter in this 1956 propaganda poster. The San Diego Chinese Historical Museum will launch an international tour Saturday of an exhibit exploring the unique role of China’s technologically sophisticated typewriters. It might seem impossible to type a language with no alphabet and more than 70,000 characters, yet China developed the technology, and it foreshadowed predictive text on today’s smartphones. The exhibition at 328 J Street is open 10:30 a.m. to 4 p.m. Tuesday through Saturday, and 12:30 p.m. to 4 p.m. Sunday. Admission is $5 and children 12 and under are free. “Radical Machines: Chinese in the Information Age” continues through April 16 at the museum, after which it will move to the SFO Airport Museum and then to New York and Hong Kong.